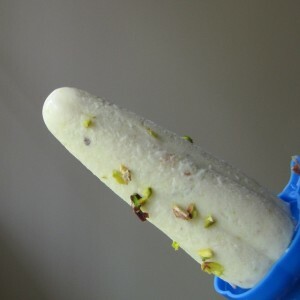 Malai Kulfi recipe by Nazia Nazar at PakiRecipes.com. A delicious ice cream that is ready in no time and hard to resist. Combine all the ingredients together and bring to a boil. Add the cardamom powder and pistachios. Simmer for 10 minutes till the mixture thickens. Cool completely. Pour into 4 kulfi moulds and freeze overnight till firm. To unmould, allow the moulds to remain outside the refrigerator for 5 minutes and then unmould by inserting a wooden skewer, stick or a fork, in the centre of the kulfi and pulling it out.